Bluesdoodles was disappointed not to be able to cover the whole weekend of the fabulous debut HRH C.R.O.W.S. If only we could time travel then we could cover more than one even over a weekend! We did, however, manage to catch-up with five of the amazing bands ensuring that HRH C.R.O.W.S. is a date that is firmly penned into our 2019 diaries. 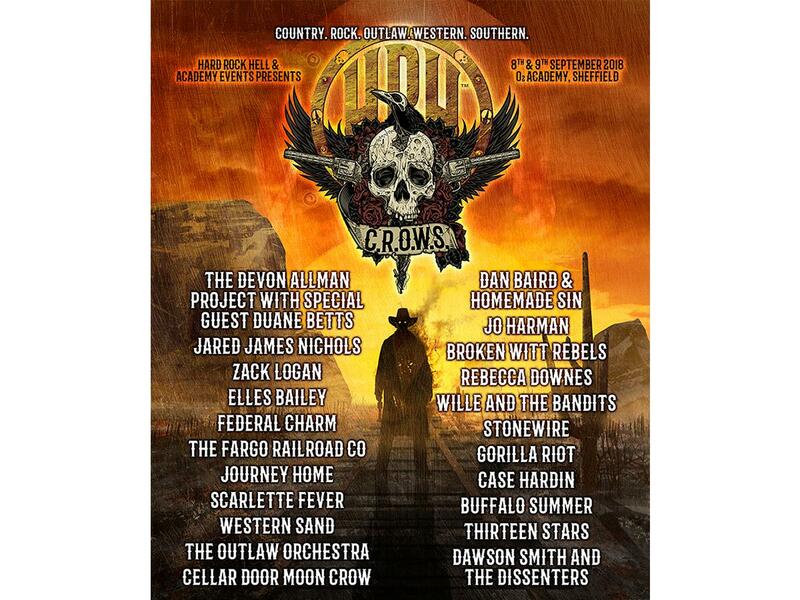 C.R.O.W.S the latest festival from HRH cross the genres, mixing the sounds as only they can, a celebration of Country Rock, Outlaw, Western & Southern Rock. This is a weekend when the music will always lift the spirits and never be boring an opportunity to hear and fall in love with new bands and make friendships as solid as the line-ups HRH always produces. Arriving later than expected I managed to catch the end of Thirteen Stars on stage 2. I thought these guys sounded fantastic as soon as I entered the room. A fabulous gritty southern rock-bluesy sound and lead singer Hoss Thompson has a great voice perfect for creating the vibe the sound created. Playing to a packed room, they received a fab reception. In fact, the area was so packed despite my determined efforts I could not get near the front with my camera, I will catch them again though soon for sure. Next up on the main stage Western Sand. A brilliant southern inspired hard rock sound. These guys rocked the stage and the crowd loved them! An awesome energetic set with highlights from thumping ‘Black Water Resolution’, ‘Broken Bones’ and ‘Welcome to the Badlands’. Showcasing music from their 2018 EP Live At The Joiners & the now Sold out EP Cut You Down To Size prooving they are finding fans and are ones to watch and listen too, Support live music and check out their next. The band played a set that delighted, despite Tyler having a guitar strap fail mid-performance, this didn’t phase them, they played o their storming hard southern rock sound. A short break to go grab a drink and a wander around the stalls dotted around the edge of the arena. Followed by the familiar sound of Jared James Nichols. As I recently watched him 3 days prior to the festival, I knew I was in for another treat. Raw and gritty blues-rock delivered by this talented guitarist and vocalist. Joined by the energetic bassist Gregg Cash and Dennis Holm on drums, these guys had the crowd eating out of the palm of their hands with their set including ‘Can you feel it’ ‘Old glory and the Wild Revival’ and a heavier ‘Don’t be scared’ Go check them out soon, you won’t be disappointed while you wait for his next tour listen to Black Magic his latest album. Broken Witt Rebels The band creates a unique mixture of blues soul and rock. Lead vocalist Danny Core performs with pure energy and passion. An entertaining set with every member of the band enjoying it and looking to be in their element. Tracks from their new album, Snake Eyes, including ‘Howlin’, ‘Georgia Pine’ and ‘Low’ got the crowd joining in singing and dancing. Everyone was in the festival mood as we waited for the closing act of a fantastic weekend of music. Chatting to people who had been sensible and been around for every note played their wee so many highlights. Many people were dashing off to book for round two in 2019. Headliners Devon Allman Project was just amazing. Fronted by blues music award-winning singer, guitarist and producer Devon Allman, son of the late Gregg Allman. He was joined by Tyler Jackson Stokes, Johnny Stachela, R Scott Bryan, Nicholas David, John Lum and David Corgan with special guest Duane Betts. Breezing on stage they had every member of the crowd mesmerized from the off with their 70’s funky vibe. A strong bond clearly formed with this band and they have fun along with being absorbed in their talent. Songs included ‘Blue sky’, ‘In memory of Elizabeth Reed’ and ‘Midnight Rider’ and a few covers were thrown in including Marvin Gaye and Don Henley. This was a very powerful rhythmic southern bluesy-rock sound, just fantastic, and not one to be missed! See you for HRH Crows II – HRH are announcing bands for next year’s trailblazing adventure, to take place between 7th-8th September 2019!